"Challenged by isolation and barriers unknown to many Nashvillians"
Explores Nashville’s status as "destination city"
The Tennessean published this story about the new, original documentary from Nashville Public Television: Next Door Neighbors: Little Kurdistan, USA. Airing Wednesday at 8pm, it is the first in a series about immigrants in Nashville. Just yesterday, NBC's Today Show identified Nashville as one of the "5 friendliest cities in America." Nashville's reputation for hospitality is often intertwined with the welcome the city extends to immigrants (see story here). Over the past thirty years, Kurdish immigrants in Nashville have started the first Kurdish Mosque in the United States and opened businesses, restaurants, markets and bakeries, building what is now the largest Kurdish population in North America. 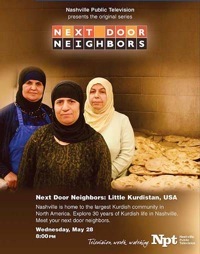 On Wednesday, May 28 at 8:00 p.m., Nashville Public Television (NPT) introduces the city to this thriving community with the premiere of NEXT DOOR NEIGHBORS: LITTLE KURDISTAN, USA, the first in a new series of documentary programs under the NEXT DOOR NEIGHBORS banner. The first significant wave of Kurds arrived in Nashville in 1976. They have since established a vibrant community recognized by Kurds nationally for its strong cultural and traditional heritage. The half-hour NEXT DOOR NEIGHBORS: LITTLE KURDISTAN, USA examines how these Kurds have adapted to life in Nashville and provides insight into the struggles refugees face as they build new lives in a new home. The documentary explores what it means to be Kurdish, and reflects on the journey Kurds make as they become Kurdish-Americans trying to assimilate into American culture and still hold on to their traditions. In addition to meeting a variety of Kurdish immigrants and Kurdish-Americans, viewers will also visit Azadi International Foods for fresh-baked Kurdish bread, go inside the Salahadeen Center, the first Kurdish Mosque in the United States, and hear about life in Nashville from younger generations of Kurds. The NEXT DOOR NEIGHBORS series looks at Nashville’s status as a new destination city for refugees and immigrants, and explores the rich diversity of people now calling Nashville home. Across the United States, mid-sized cities like Nashville are experiencing unprecedented growth in their international populations. Together these communities are redefining the traditional international city on a smaller local scale. The NEXT DOOR NEIGHBORS series will include in-depth web content at wnpt.net, public forums and feature a panel discussion after each of the four programs. NEXT DOOR NEIGHBORS: LITTLE KURDISTAN, USA is made possible through a grant from the Corporation for Public Broadcasting’s My Source initiative and is supported by The HCA Foundation on behalf of HCA and the TriStar Family of Hospitals. A partnership with the Vanderbilt University Center for Nashville Studies provided valuable research and community outreach.